All three of Cunard’s Queens, Queen Mary 2, Queen Elizabeth and Queen Victoria, visited Southampton together last Tuesday to celebrate the Diamond Jubilee of Queen Elizabeth II in possibly the biggest such event outside London. On the same day, the line announced that it is looking for more first-timers and wants more UK agents to work with it. In four weeks time, it will be the turn of P&O Cruises, who will bring all seven of their ships to Southampton on Tuesday 3rd July to celebrate its 175th Anniversary. Elsewhere, Carnival Corp & PLC has announced a plan to revive cruising to the north shore of the Dominican Republic. Meanwhile from Lisbon comes news of the death of Classic International Cruises founder George Potamianos. The line has also announced the charter of Athena to Germany’s Ambiente Kreuzfahrten for a late summer season of five cruises in 2013. This will be followed by an even bigger event four weeks later, when P&O Cruises has invited the Princess Royal to Southampton to conduct a fleet review on the event of its 175th Anniversary on Tuesday July 3. All seven UK-based P&O ships (there are three more in Australia) will visit Southampton on the same day. But Cunard still takes precedence as the Queen has christened two-thirds of its fleet – Queen Mary 2 in 2004 and Queen Elizabeth in 2010 – but only one of P&O’s, the 69,153-ton Oriana in 1995. As the Queen Elizabeth and Queen Victoria took bow-to-bow positions near the City Cruise Terminal, Queen Mary 2 edged in to create a three-bow formation while flag-waving crew lined the foredecks off all ships and their whistles sounded a salute. After the event, Queen Mary 2, Queen Victoria and Queen Elizabeth passed in single file down the Solent as they all set out on celebratory Diamond Jubilee voyages with a total of about 6,000 passengers. 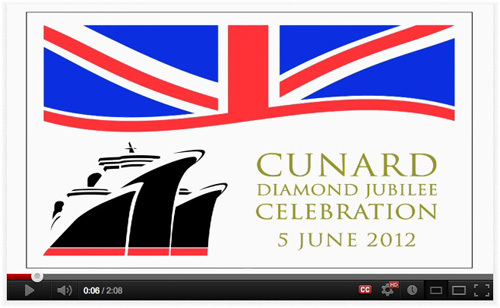 Cunard’s turn for its own 175th Anniversary will come in 2015. Cunard could have made this job much easier for itself if it had not reduced travel agents’ commissions from 12.5-15% down to 5% earlier this year. Meanwhile in Canada, the Port of Saint John, New Brunswick, has announced that its new cruise terminal, expected to open this autumn, is to be named the Diamond Jubilee Cruise Terminal. The announcement was made on the occasion of the Diamond Jubilee visit to Saint John of Prince Charles, heir to the throne, and Camilla, Duchess of Cornwall, on May 23. The first caller to the new terminal is expected to be the 83,338-ton Disney Magic, which is scheduled for September 5. Saint John also has the nearby Marco Polo Cruise Terminal, named after a locally-built clipper ship, and a facility at Long Wharf. The Canadian port expects seventy-three cruise ship visits this season with more than 187,000 passengers. Carnival Corporation & PLC has announced plans for a new $65 million two-berth cruise ship centre in the Dominican Republic. The new 30-acre Amber Cove Cruise Centre is being built at the Bay of Maimon, about fifteen miles west of Puerto Plata, and is due for completion in 2014. The new terminal is a joint project between Carnival and Báez & Ranick, a local ocean transportation, logistics and marine services group. The project is designed to re-establish the Dominican Republic’s north coast as a popular cruise destination. The last cruise ship to call to Puerto Plata did so nearly thirty years ago now but the new facility is expected to host more than 250,000 cruise passengers in its first year of operation. Carnival is expecting the new cruise hub to host up to 8,000 cruise ship passengers daily — vastly more than the 350,000 cruise passengers who visited the Dominican Republic in 2011. Last year saw a 1% decrease in passenger numbers to the country but Carnival is hoping its $65 million investment will reverse that trend. 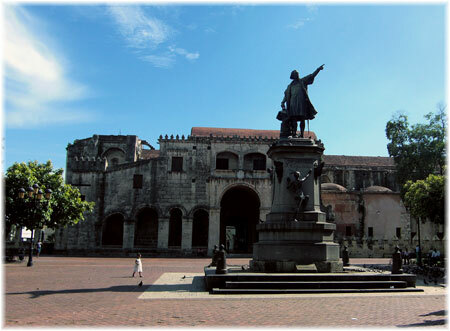 Puerto Plata was in the past the country’s second cruise destination after Santo Domingo. As well as offering a gateway into the Dominican Republic, the cruise centre will include thirty acres of waterfront property and will feature a welcome centre, a variety of retail offerings, themed restaurants and bars and a water attraction. A transportation hub will allow visitors easy access by land and sea to the surrounding attractions. The news follows by two years the 2010 announcement of a $27 million terminal for Puerto Plata that did not involve cruise lines and was the subject of much criticism. As Steven Stern says in his Stern’s Guide to the Cruise Vacation, “In Puerto Plata, there is little to do other than shop for amber in the local market, but if you feel adventurous, rent a horse at the dock and ride through the countryside to the beach.” Amber Cove is of course fifteen miles to the west of Puerto Plata. A precedent for the Amber Cove project is Carnival’s own Mahogany Bay Cruise Centre in Roatan, Honduras, which it opened in 2009. Mahogany Bay has now hosted more than a million passengers, not only in Carnival ships but also in ships from Princess, Holland America, Seabourn, Costa and P&O, as well as non-group vessels. Another is Grand Turk Cruise Centre, which Carnival opened in the Turks and Caicos Islands in 2006. It will host 285 ships bringing 675,000 visitors this year. Carnival Corp & PLC seem to be building themselves a stable of these new ports in the Caribbean. The sad news reached us recently of the death on May 29, 2012, of Classic International Cruises founder George Potamianos, a cousin of the Greek-based Potamianos family that was involved in Potamianos Lines and Epirotiki Cruises. George had his start with Epirotiki Lines in the early 1970s and had then been involved with cruising in Portugal since 1976. His sons will take over the business. Meanwhile, Classic International has announced that it will be chartering the 16,144-ton Athena to newcomer Ambiente Kreuzfahrten of Berlin for five cruises in August and September of 2013. This will be in addition to the 16,531-ton Princess Danae, which has been on charter from Classic International since April under a three-year agreement. Classic International has this year scheduled Athena’s annual voyage from Europe to Australia cruise from Marseilles, with departure scheduled for November 12 and arrival in Fremantle a week before Christmas. The Athena leaves Europe for Fremantle every winter for the peak Australian summer cruising season. Classic International operates five classic cruise ships in various charter markets as well as operating for its own account. Its first cruises were with the 9,563-ton Funchal, which cruised from Sweden for Stena Line in 1977 and for what is now Classic International from 1978 to 1985, when Potamianos bought the ship. The Funchal is now in Lisbon undergoing a substantial rebuild to bring her up to the latest Safety of Life at Sea standards. No date has yet been announced for her return to service.